Welcome to Haland Stable. Located on Cape Cod, in the village of West Falmouth Massachusetts. 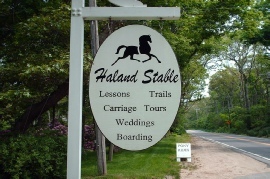 Haland Stable is a full service boarding and training facility. 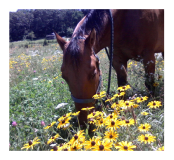 It provides a safe, caring and healthy environment for both horse and rider. Our services include boarding, horseback riding lessons for children and adults, trail rides, pony rides, and summer horsemanship classes. New customers are always welcome. We are open year round. Haland Stable was established in 1965 by Hazel (Landers) Shaw, and is currently family operated. It is located on Cape Cod in picturesque West Falmouth, Massachusetts on 5 ½ acres of pristine land which abuts conservation land and several miles of scenic trails. It is one of the few stables that has large turnout areas with lush green pasture for group and individual horses. Fenced in riding ring and round pen are used for training purposes. Box stalls are all rubber mated with good ventilation and well lit. A wash stall with hot water is ideal for those who want to bathe their horses. 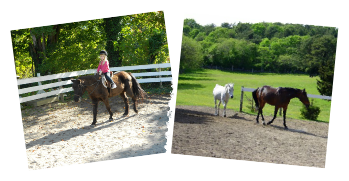 Hazel, owner of Haland Stable, has held an advanced riding instructors license in Massachusetts for many years. She also holds a Bachelor of Science degree in Education. Since Hazel has vast knowledge in the Equine field and instructing, she was interviewed in 1988 by the State for the position “Supervisor of Riding Academies in Massachusetts”. She was notified that she got the position but not the job since the Governor had put a freeze on hiring. For 3 years she was on the “Horse Advisory Board” for Massachusetts and represented Cape Cod & the Islands. She has been involved with the Cape Cod Farm Bureau and was a board member for several years. Several horses have been bred at the stable and had foals, which were raised there. Riding instruction is given to children and adults. Children need to be four years old and up to start lessons. Those children younger are given pony rides around the perimeter of a large green field. Hazel has always had a passion and love for horses and enjoys working with horse and rider. She has ridden many disciplines (hunt seat, saddle seat, western, and driven horses and ponies in harness both single and double). Hazel has not only competed herself and won year end awards for Massachusetts & New England and competitive trail rides but her students have done equally as well. Her students have also received challenge trophies on some of her well trained horses. Stop in to witness the stable for yourself and feel the history.